Jeff Parker takes a look at the TrueType body from Hot Toys, one of the nicest (if not the best) sixth scale bodies on the market today. Show us all the nekkid goodness, Jeff! 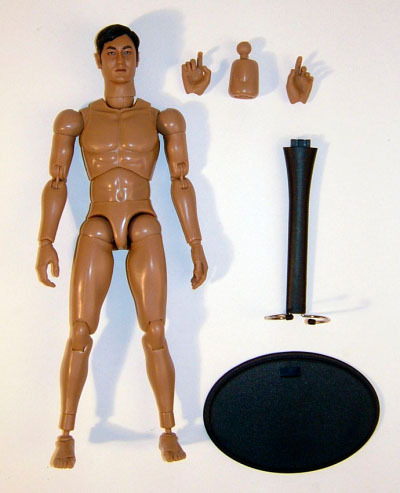 This isn’t a review, more a description of the Hot Toys (HT) base body known as the True-Type (TT). 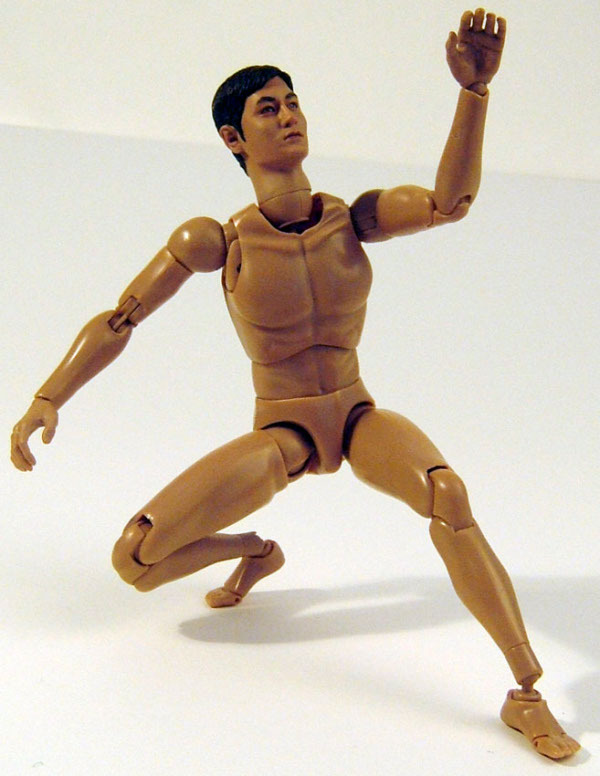 I’ve been reviewing a lot of the 1/6 figures from them recently, so the ‘articulation’ category can get pretty repetitive and in doing this it will act as a description I can link to whenever the TT is used. I’d like to point out that in none of the photo’s (apart from the DaVinci’esque styled Vitruvian man) has any photo shop been used to mask stands or tape. 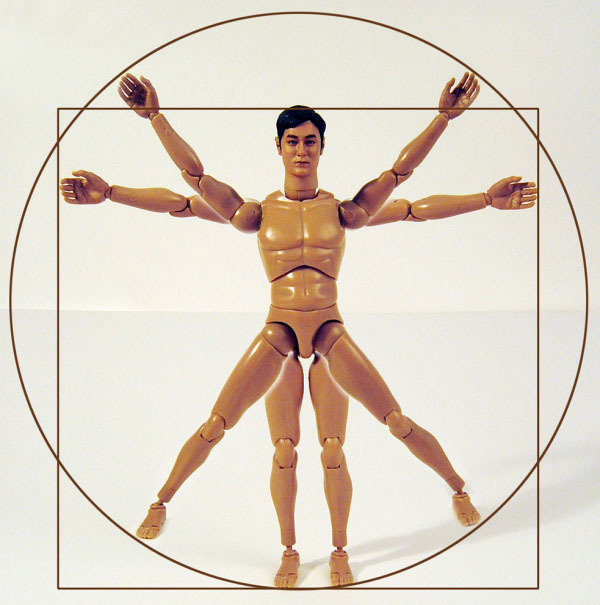 All the poses were achieved using the figures centre of gravity. So starting from the feet up, we have a hinged joint so the toes/forefoot can bend for crouching positions. 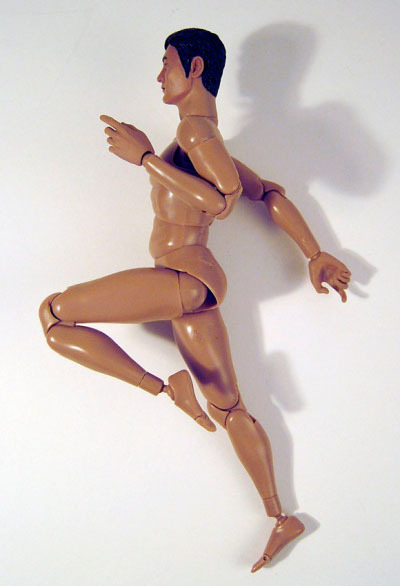 The ankles are a double-ended ball joint offering a great range of positioning, meaning the foot can be placed flat on the ground even when the hips or knees are angled away from the body, they also mean the feet can face in any direction. Just above the ankle is a cut joint. This is glued in place, but can be removed should you want to shorten the figure. It’s more a job for a confident ‘customiser’ rather than a casual ‘alteration’. Unless you really know what you are doing, I’d always recommend that if something doesn’t seem to ‘want’ to move, don’t force it. 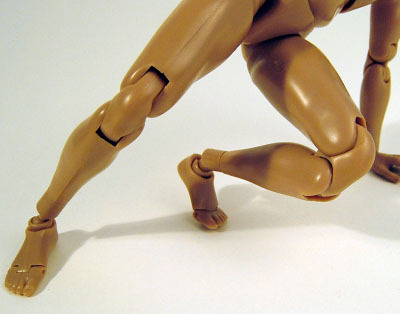 Next up are the double knees, pretty standard these days, but they enable the knees to completely double back on themselves for a convincing kneeling position. 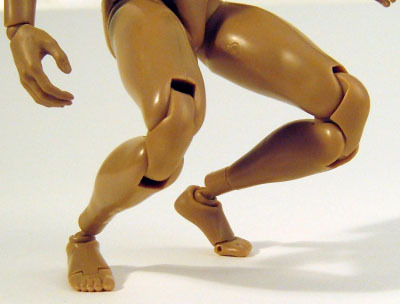 The hips have a ball joint attachment at the top of the leg and at the pelvis, so pretty much any position a non-contortionist can assume is achievable with this figure. The only real restriction is when trying to push the leg backwards, as the engineering at the top of the leg comes up against the bottom ridge of the buttock. However this means that when dressed the clothing will look much more natural from behind, but some movement is lost. The waist and mid-abdomen have a ball-jointed mechanism, there’s not a huge amount of movement here, but certainly enough to mean a slight curvature can be given to the trunk either side to side, forwards or backwards. The shoulder is just about the most complicated joint on the whole figure. Housed within a cavity in the shoulder area is a post that can spin forwards or backwards and it can also rock up and down attached to this is a peg going into a ball. This ball is then attached by means of another free moving peg to the top of the upper arm. I hope this description gives you some idea, but what you end up with is a universal joint that needs you to sit and study it for a few minutes. Once you have familiarised yourself with its full range, you’ll be amazed at what positions you can get it into. 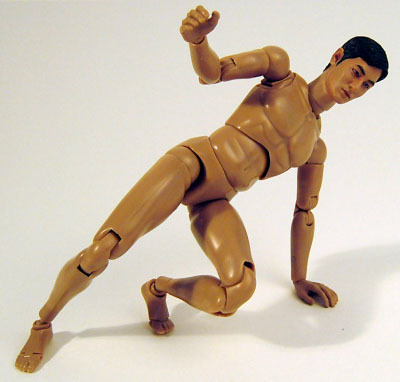 Next down the arm is the double-elbow, this operates like the double knee meaning the arms can fold directly back on themselves a full 180 degrees. The wrists are a cut-ball, with a peg at either end of the radius, one pushes into the lower arm and the other fits straight into the hand. The base body comes with four hands, two pistol grip and two relaxed, these are easily exchangeable, but should you ever have any problems, either a dunk in boiling water or a few seconds warming from a hair-dryer will normally make them slip on and off a lot easier. Last up is the neck post. Hot Toys use three designs of post. 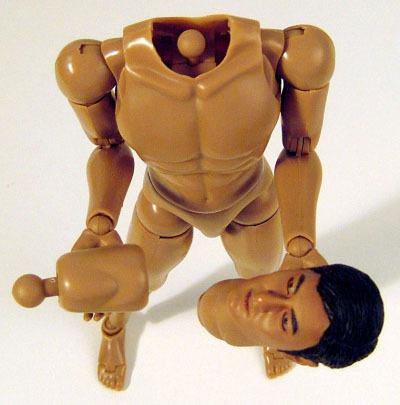 One is for attaching to a head with a sculpted neck, this simply attaches at the base of the neck and then in turn attaches to the body by a counter sunk ‘pop-in’ ball joint. This design works well on figures that require sculpting or paint apps, that can’t just stop at the chin, the other kind of post (both of which are supplied with the base figure) has a ball joint at both top and bottom. This obviously requires a different type of head design, with no neck included so the top ball joint just pops into a countersunk hole and cup in the underside of the head. 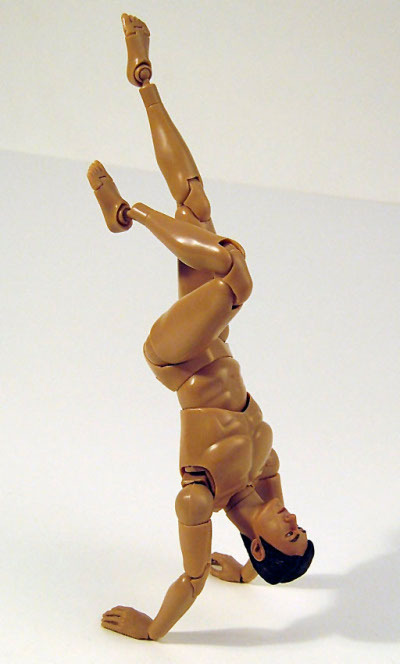 This allows for a greater degree of mobility so the head can look up and down more acutely, it also means that when tilting the head from side to side you can achieve a little more ‘character’ in your poses. It’s also worth noting again, that if you ever experience any difficulty getting the heads on or off, a little heat application can go a long way. 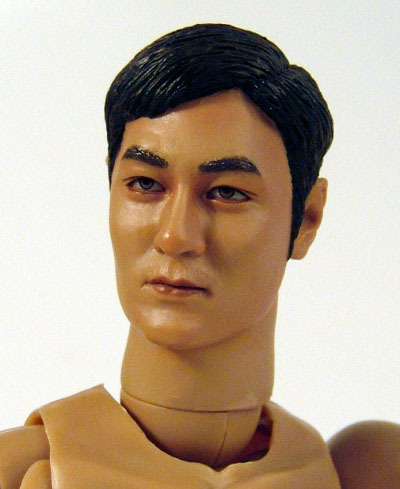 A few recent releases like Will Turner, James Dean and Won Ka Kui have used a different neck post that is sculpted into the chest, this is to achieve a better aesthetic with characters with open shirts and visible necklines (the standard base TT isn’t like this). 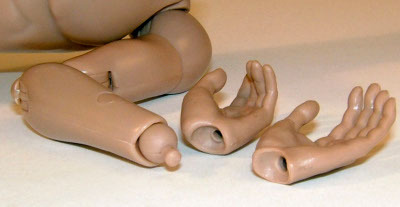 Some figures also come with moulded boots that the ankle pegs fit directly into, and others have hand and glove sculpts that require a cuff or gauntlet to cover the wrist joint. These are obviously to keep the final look as accurate as possible to the source material and keep the aesthetic pleasing, but in these cases some of the mobility in these joints will be lost. There, I think that covers everything. At present the TT is my favourite base body, there are aspects of the Medicom RAH 301 that I really like, there’s no denying that it is also a wonderful piece of engineering, but its fragility has started to worry me more and more having had two break at the hip without any real pressure being applied, and to some it’s slightly smaller scale seems an issue. I’m hoping the new SST Prometheus will stand up well (pun intended) against the TT, but only time will tell. You can also use the sponsor MyAuctionLinks to search ebay.